With just a few easy steps, you can have an immediate, lush green lawn with Arizona sod from West Coast Turf/Western Sod. 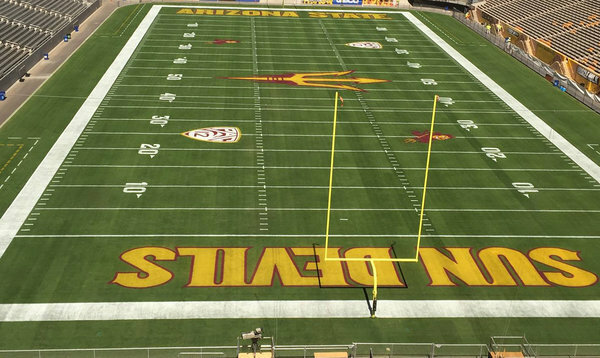 Even in the distinctive Arizona climate, sod is a great choice for your lawn and West Coast Turf/Western Sod has a large variety of turfgrass sod to ensure you have the best sod for your project. We provide superior customer service and comprehensive recommendations to help you order, install and maintain a beautiful turfgrass lawn. West Coast Turf/Western Sod is a nationally known industry leader providing turfgrass sod to major clients including: Chase Field in Phoenix; PetCo Park in San Diego; Dodger Stadium in Los Angeles; Camelback Ranch training facility in Glendale, AZ; Salt River Fields at Talking Stick in Scottsdale, AZ; Karsten ASU Golf Course, Tempe, AZ; Phoenician Golf and Tennis Resort, Scottsdale, AZ; Pebble Beach Golf Club, Pebble Beach, CA; Desert Mountain in Scottsdale, AZ; The Estancia Club in Scottsdale, AZ, and many more major sports turf and other turfgrass using facilities. At West Coast Turf/Western Sod, we offer a wide range of cool season grasses, warm season grasses, specialty grasses and greens quality grasses. Our representatives are available to help you with any questions to find the best sod for your area and season. Be sure to measure your space correctly and plan all preparations to be done before sod delivery. One of the major benefits of choosing sod is that is can be planted any time of year in Arizona. To ensure a healthy lawn, one of the most important steps is prepping the soil. We provide our Arizona Sod Installation Guide with detailed instructions on how to best prepare your soil including raking and removing rocks, and fertilization if necessary. Instructions for installation are included as well. Be sure to plan your installation for the same day as delivery. Sod is a live plant and needs water and soil to live. Any sod that isn’t installed on delivery day should be kept in the shade and covered with moist burlap. With proper care, sod can be ready for “wear and tear” in just a few short weeks. And, you may be surprised that it shouldn’t be watered every day. Following our West Coast Turf/Western Sod Watering Guidelines for Arizona Sod will help you grow hearty, drought resistant turf. For additional tips and instructions on healthy grass, we provide Sod Maintenance Tips as well. For common questions and answers about sod, see our Sod FAQs, and for more in-depth discussions check out our Mr. Wise Grass Blog that provides information on an extensive range of sod topics including seasonal grass tips, grass fertilizing, which grass variety to choose and so much more. Whatever turfgrass project you are planning from a home lawn to municipal park to a golf course to a major sports stadium, West Coast Turf/Western Sod has the right grass and extensive experience to provide everything you need. We can custom grow your sod for your specifications with the latest growing technology, provide custom solutions for delivery and fast, expert installation as well. Contact us at 888-893-TURF (8873) or order sod online at www.westcoastturf.com.